Original handmade custom leather cat collars with safety breakaway protection system! All Custom Designs are Exclusive made of High Quality Leather – Click to Go to the Online Boutique! All my leather cat collars are original and customized by me. They are made of the highest possible leather quality and offered at the best possible price. GO TO THE ONLINE BOUTIQUE! Each collar has a protective safety breakaway elastic system. Be assured that your cat will always be save and cannot get trapped hung up to something. 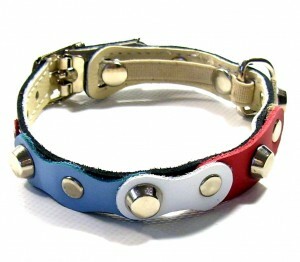 The leather bases of the cat collars are specially manufactured for superpipapo. All custom cat collars are unique and made of the highest quality Spanish leather and other accessories. I choose the adornments based on their resistance. They are fixed upon the collars using stainless steel fittings. I prefer to work with natural materials. The materials are tested with my own dogs and cats. I live in the Mediterranean. Sun and salt are fanatical enemies of each material. This gives me a good idea of the quality and applicability of the used accessories. If today you don’t see anything at your taste, please come back tomorrow. I continually design new cat collars. Sure that soon enough you will find the one you dreamt of. Make your cat and yourself happy! For interesting information about cats, this is a nice website!